Monnerat’s father worked for a civil engineering company, specializing in maritime works — harbor construction, coastal protection, and such. His family lived in Ivory Coast, Cameroon, and Tunisia, but Monnerat spent most of my early life in Lomé, the capital city of Togo. So, this is the story of how that tenacious, sometimes obstinate and excessive youngster grew up to become a top engineer for one of the world’s leading aerospace firms. Monnerat took his baccalaureate in Togo, and then moved to France to attend a superior mathematics school, in preparation for engineering school. Mathematics and the sciences in general played a big part in his life since my early childhood — “actually, for as long as I can remember,” Monnerat says. He remains drawn to all of the sciences, but math holds a special place. Eloquent words from a man grounded in the hard reality of space engineering. 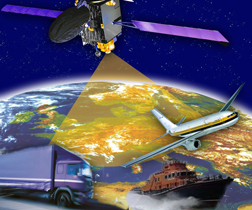 Monnerat has been involved in the Galileo program since 1998, from the early phases of the program, particularly in signal design and performance evaluation. His core specialty is in signal processing techniques, but Monnerat says he is equally intrigued by the related subject of software programming. Monnerat graduated as an engineer from the Ecole Nationale Supérieure d’ingénieur de Construction Aeronautique in Toulouse, now known as the Institut Supérieur de l’Aéraunotique et de l’Espace. He got a job with Alcatel Space in 1997, working on space radar programs, in particular on the development of the signal-processing unit of the Poseidon 2 altimeter. After that, he moved to onboard processing systems, working on the ARGOS/SARSAT payloads, and to the development of the ARGOS/SARSAT spaceborne processing instruments (ARGOS 3 and SARP3), designing the new-generation beacon signals. Monnerat began working in GNSS for Alcatel Space, now Thales Alenia Space, in early 1998, and was involved in the early stages of European GNSS, including work on signal definition for Galileo and EGNOS — the European satellite-based augmentation system (SBAS). The turning point that led him to GNSS was the launch of the first Galileo studies.” The first one, he says, was a national feasibility study carried out by the French Space Agency (CNES) and the French Department of Defense. The second, the EU architecture study, GALA, was aimed at sketching out the overall Galileo structure and deriving the system’s requirements. When the proposed Galileo evolved from concept into a real program, he says, several issues had urgently to be addressed, among these the signal definition itself, but also the International Telecommunication Union (ITU) frequency filing to which Monnerat contributed and compatibility with other RF systems (whether GNSS or not)). Then, in 2000, Monnerat says, everything changed. First, there was the plenary session of the European Navigation Conference, in May 2000 in Edinburgh, Scotland, where NASA head Dan Goldin announced the Clinton administration’s decision to remove selective availability from GPS signals. And, in that same year, at the World Radiocommunication Conference in Istanbul, the Galileo filing was agreed, paving the way for the development of Europe’s own GNSS. He has, crucially, been active in all Galileo development phases — from very early ones to the current status — an alphabet soup of activities encompassing in-orbit validation right through to full operational capability, without forgetting the search and rescue service, for which he has a particular interest having been involved in COSPAS-SARSAT developments for a long time. Monnerat also rapidly became involved in downstream application developments, from GNSS receiver design to any kind of hybridization involving mobile telecommunication signals and GNSS signals. He made important contributions in support of European GNSS standardization, to insure its penetration in day-to-day life. He mentions “one of the most exciting projects in my life,” the development of location-based solutions at Thales Alenia Space, one of which involves blending mobile telecommunications signals – 2G, 3G, 4G or WiFi — and GNSS signals for improved quality of service, including indoor positioning. “The field of mobile telecommunications is intense, fast-moving, and innovation-driven,” Monnerat says. The mass market, particularly mobile phone users, will be among the main user groups of GNSS, and that means developments and changes in GNSS must take this community into account. One indication of the significance of Monnerat’s work are the more than 40 patents he currently holds, covering, among other things, GNSS receiver technologies, indoor positioning, and integrity of positioning. Monnerat’s Thales role has also allowed him to keep in touch with his African roots, including involvement with the SAGAIE project. Designed to model the ionosphere over the sub-Saharan region in support of a prospective SBAS over the area, SAGAIE saw Thales Alenia Space, the Agency for Aerial Navigation Safety in Africa and Madagascar (ASECNA), and the French Space agency CNES cooperate to deploy a network of GNSS sensors stations — including at a site near Monnerat’s childhood home in Lomé, Togo. As with many professional scientists, however, Monnerat has had to make some sacrifices in terms of his personal life. He is not married and has no children. “Yes,” he says, “science implies a lot of time. It is hard but fascinating work, and we often do not notice the time running or the years going by. And time is the main sacrifice, the time I have devoted to my work. Does he ever think of a life after engineering?